On-page SEO is no longer a simple matter of checking things off a list. There’s more complexity to this process in 2016 than ever before, and the idea of “optimization” both includes and builds upon traditional page elements. 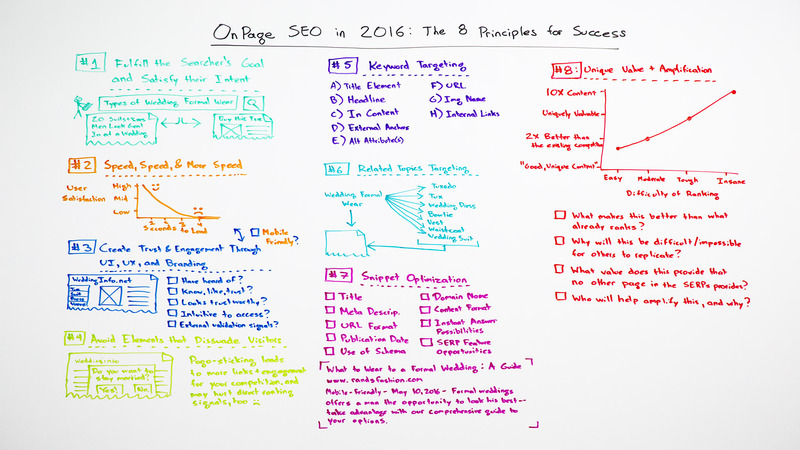 In this Whiteboard Friday, Rand explores the eight principles you’ll need for on-page SEO success going forward. Howdy, Moz fans, and welcome to another edition of Whiteboard Friday. This week we’re going to chat about on-page SEO, keyword targeting but beyond keyword targeting into all the realms of the things that we need to optimize on an individual URL in order to have the best chance of success in the search engines in 2016. So what does that involve? Well look, we could spend a tremendous amount of time on any one of these, but I’m going to share eight principles that are behind all of the tactical work that you would put into optimizing that page for that keyword term, phrase, or set of phrases. Most likely, in 2016, it is a set of phrases that you’re targeting rather than just a single keyword term. What we are trying to do is fulfill the searcher’s goal and satisfy their intent. So there’s an intent behind every search query. I’m seeking some information. I’m seeking to accomplish a task. Oftentimes, that initial intent is different from the final goal that someone might have. I’ll give you an example. When someone searches for types of wedding formal wear, we might infer from that query that, right now, their specific intent behind this search is they want to see different kinds of potential formalwear that they could wear to a wedding, maybe as a guest or as a bride or a groom. But their ultimate goal is probably going to be to decide on one of those specific things and then potentially purchase that item or take something from their wardrobe and add it in there. That’s tough for a bunch of reasons. You don’t know whether that formalwear is going to be necessarily black tie in the United States, which is tuxedo. You don’t know whether that person is a male or a female when they’re performing the search. A woman, well, they might buy a tuxedo but probably not, at least statistically speaking, they’re probably not going to. They’re probably going to buy a dress. You might have much more success with a piece of content like 20 suits and tuxes men look great in at a wedding. 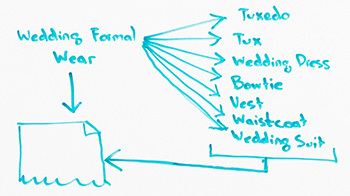 Especially if I’m targeting men or if this is types of men’s wedding formalwear, that’s probably going to be the piece of content that has a great chance of serving the searcher’s intent and fulfilling their goals, especially if we then take that content and link off to the places where you can buy or accessorize all those different pieces. So we’re trying to do both of these items in number one. Related to number two is number three, which is creating trust and engagement through UI, UX, and branding. Speed is certainly a big part of the user experience. This is also critical because these two both touch on being mobile friendly, having that multi-device friendliness so that it’s capable on any device. UI, UX, and branding though go into some different areas. So if I have my website, I’m really looking for a few different aspects of it from the SEO point of view. Do you have UI and visual elements that make them perceive you as being trustworthy, even if this is the first time they’ve ever heard of you? That can be things like the images on the page. It can be the navigation. It can be the color scheme. It can be the UI library that you might be using or how you’ve done the visual layout of things. All of those pieces go into that “Do you look trustworthy?” That’s certainly a consideration that a lot of folks have when they’re looking at searches. Hopefully, you have some external validation signals to indicate that the content you have and the brand that you are is trustworthy. Those can be things like testimonials. They can also mean things like references or citations for the data or information that you’re providing or links out, all that kind of stuff. You want to avoid elements that distract searchers or dissuade them from visiting you either at this time or in the future. The most common ones of these that we like to talk about a lot are ones that interfere with the content consumption experience. That’s things like overlays. “Do you want to stay married? If so, download our guide.” Then you have to say, “Yes, of course I want to stay married,” or “No, I’m a terrible person and I will not click on your popup,” and then another popup will come up. Those types of overlays obviously have negative impacts, and you can see them in your user and usage data, your engagement data. You can determine how much of a sacrifice you’re willing to make in exchange for, “Well, we did get some email addresses out of this, or we got some conversion rate and so we’re willing to make that sacrifice,” versus “No, we’re not willing to make these sacrifices.” You have to choose what types of engagement-dissuading apparatuses you’re willing to put on your site. But be aware, pogo sticking is a ranking signal. It’s something that they judge indirectly for sure and directly potentially as well. Pogo sticking meaning a searcher clicked on your listing in the results, they went to your site, and then they clicked the “Back” button and chose someone else from the results. Google interprets that and Bing interprets that very poorly for you. 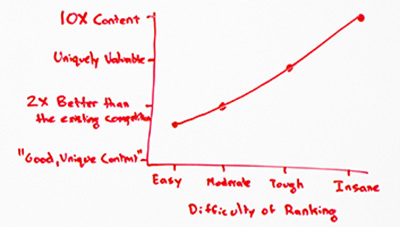 Keyword targeting, classic on-page ranking signal, still true today. I know that many of us still see or are starting to see a lot more entrants into the search results that don’t do very particular keyword targeting, at least don’t do it the way we’ve historically perceived it, where it’s very keyword-driven. But it’s still incredibly smart to do this if and when you can. You just need to balance it out with all these other aspects. Places that I would start. In fact, this is basically in order of importance. Title element, I would place the keyword term or phrase, the most important term or phrase that you’re targeting in the title element in the headline of the page. That can be the H1 tag, but it doesn’t need to be it. It could be just the bold, big headline at the top. That should match the page title generally speaking or be very close, because what you don’t want is you don’t want a searcher who clicked on one title element and then landed on a page that had a different headline and they perceived that mismatch, and so they clicked the “Back” button. That’s dangerous. You want it obviously in the page content. If you can, when you can control it, you want it in external anchor links to the page. So if, for example, I have my home page about weddings and I am interviewed for something, I might put in my bio something about the wedding styles website that I own and control, and I would link back to that in that external anchor text. I want it potentially in the alt attribute of any images or photos or visuals that I’ve got on the page. I want it in the URL. Again, if I can control it and the URL is less important, so we’re going in decreasing order of importance here. I want it in the image name. Especially if I’m trying to rank in Google image search, image name, the file name of the actual image does matter and is important. Finally, I want it in internal links to the degree that it’s intelligent and balanced and doesn’t look spammy. Do all these items, you’ve got your keyword targeting down. But this is not like the past, where just nailing keyword targeting is going to take my rankings to where they need to be. I’ve got to do all these other seven things too, including number six, related topics targeting. So related topics is basically this concept that Google has a huge graph of lexical combinations and semantic analysis. They can essentially say, “Hey, when we see wedding formalwear, we often also see these terms and phrases, terms like tuxedo, tux, wedding dress, bowtie, vest.” In the United Kingdom, almost certainly we would see waistcoat, which is what we call a vest here in the United States, or a wedding suit, which is what is traditionally worn in weddings in the U.K. versus a tuxedo here in the United States. Now, given that Google sees these terms and phrases very commonly associated with this one, they’ve essentially started to build up this graph between these, and so these topics they would say are very important to this search term. If someone’s looking for wedding formalwear, it’s unusual for them to find a page that has high relevance for users that doesn’t also include these types of words and phrases. Therefore, as a search marketer, as a content creator, we need to think about: What are those terms and phrases that are related here, and how do I make sure to include them in my content? If I don’t, my ranking opportunity may decrease compared to my competitors who’ve intelligently used those terms and phrases. With a page, we’re not just trying to drive the ranking. We’re also trying to drive the click. So ranking number four and earning a 6% click-through rate, that might not be great, especially if the average is more like 11%. Then we’re earning half the average for our ranking position. That seems a little funny. Those percentages are not precise, but you get the idea. Whenever there’s an opportunity, for example, if you’re in the recipe space, there are schema markups specifically for recipes. If you’re in the news space, there are opportunities for news. If you do video, Google doesn’t really obey it very much, except with YouTube, but there are video opportunities for schema markup. There are all sorts of other kinds depending on what you’re in, certainly local and maps and a bunch of other ones. That is something to consider. In fact, when you’re registering a domain name and building out a site, you should be thinking about how people want to click on it, the brandability, the snippet optimization, all that. Content format is particularly important because Google, especially when there’s a more question-based search query, they’ve started showing those longer meta descriptions. So if you can encapsulate what you know is essentially the critical piece of content that answers the user’s question, chances are you might be able to get that larger space, vertical space in the SERP, and that might mean that you can draw more clicks in as well. This works really well with lists. It works nicely with forums and discussions, threads. It works nicely with elements where you have a bunch of specific how-to, step-by-step process, those types of things. Same story with instant answer possibilities that you want to appear at the top of that Google SERP with an instant answer if you can. We know that that actually doesn’t take away click-through rate. It actually drives more of it. In fact, the real estate there means that you often get more clicks than organic position one, which is pretty great. Of course, all the different kinds of SERP feature opportunities like we talked about — images, maps, local, news, what have you. This is the final piece of things that we’re thinking about as we do on-page optimization in 2016. That is I need to be thinking about: What bar do I need to reach in order to have a chance to rank, rank well, and rank consistently? This is tough. So if the difficulty of ranking is very easy, the bar that I need to cross is probably somewhere between classic, good, unique content, like this content is good, it’s unique, and it exists. That’s all it needs. That’s a very, very low bar. Even for easy rankings, I would not suggest making that your bar. I’d put it somewhere between there and twice as good as anyone else in the competition, but essentially targeting the same types of things. You’re doing the same kind of content. You just feel like you’re better than anything else in the top 10. That might be a reasonable enough bar for an easy ranking. If it gets moderate, if it gets tough, I need to go up to uniquely valuable. Uniquely valuable, by that, we’ve had a whole Whiteboard Friday on it, which we can refer to, but uniquely valuable being this idea that I provide a value that no one else in the search results provides. So it’s not simply that I’m doing a better job. I’m also doing a unique job of providing information or data or visuals, whatever it is that is more and different value than anybody else. Then finally, what we’ve called 10x content. If you have an insane difficulty of ranking, that might be the minimum bar that you need to hit, and we’ll link over the 10x video as well. Basically, the questions that I’m asking when I’m talking about providing unique value and being worthy of amplification, which is something that our content needs to consider too, is: What makes this better than what already ranks? Do you have a great answer to that question? If you don’t, you should probably get one before you try targeting those keywords and producing that content. Why will this be difficult or impossible for others to replicate? What’s the barrier to entry that your content provides, that all the other content providers can’t just look and go, “Oh, well I see that Rand’s done a very nice job ranking there. I’ll just take that and do it. That should be easy.” You need a barrier to entry. What value does this page provide that no other page in the SERPs provides? That goes to our unique value question. The last one, who. Who will help amplify this piece of content and why? If you don’t have a great answer to who and why, it’s going to be incredibly difficult to get that amplification. If you can’t get the amplification, it’s going to be really, really hard to rank, because as much as on-page optimization does matte — and all of these eight principles matter for rankings — SEO in 2016 is not merely about on-page but about off-page as well, just as it’s been the last decade, 15 years. So, as we’re creating content, we need to think about that amplification process too. All right everyone, look forward to your thoughts, and we’ll see you again next week for another edition of Whiteboard Friday. Take care. At MECLABS, we talk a lot about the testing process. However, the testing process isn’t just a way to improve website performance. The general principles are transferable to so much more. Read on to learn how testing principles can be used to improve office productivity. When I began to practice SEO 8 years ago, I never would have guessed that I'd be writing a post about data visualization. Perhaps I might have foreseen myself writing about web analytics or information architecture, but data visualization seemed like something for the statistics fans. But today in web marketing, the emphasis on content has never been stronger, and it just so happens that one eminently shareable form of content is the data visualization. And I've come to love the crap out of data viz. Another person that loves the crap out of data viz is Edward Tufte. 'ET', as he's sometimes referred, has been preaching the merits of quality data visualization since before the world wide web existed, let alone SEO. He has authored 4 books on the topic, is a professor of political science, statistics, and computer science at Yale University, and actually serves on Barack Obama's American Recovery and Reinvestment Act panel in order to provide transparency in the use of recovery funds. I was fortunate enough to catch him when he was in Seattle during his traveling seminar tour. I learned a lot that day, and have since learned quite a bit more through reading his and others' writing on the topic. David McCandless's Information Is Beautiful Blog is a must-bookmark, and his TED talk below is a great data viz primer. What's This Gotta Do With SEO? Alright, enough with the intro. Let me quickly lay out what I hope this post will accomplish for the SEOmoz reader. Understanding of what makes great data viz great. Inspiration to think up and create (great) data viz for your company or your clients. (Maybe slightly self-serving, but…) Influence readers to cast a more discerning eye on data visualizations. So far I've yet to say it, but there's an elephant in the room. Infographics. The buzz around the word has reached a fever pitch. Yes, infographics are a form of data visualization, but there are so many ways that infographics are being abused that the backlash seems to be rightfully mounting. Are all infographics bad? Of course not. Just the bad ones. So, Wait. Am I Gonna Get Links or What? As I stated earlier, and as you've probably seen, data visualization is a super-effective and shareable form of content creation. Now stay with me here: In this post I'm going to detail some of the principles of great data visualization as per Tufte's teachings, with examples that fit the bill. As of the writing of this sentence, I've yet to pull link metrics for any of the examples I've got planned. By the end of this post, I'm hoping to prove to you (and myself, really) that Tufte's principles aren't just highfalutin, hoity-toity, stats nerd stuff, but a checklist for highly effective data visualization link building. Well, yeah. There have certainly been successful "infographics" that don't actually display any real data, but that's not really a piece of data visualization, is it? The Trustworthiness of Beards by Matt McInerney comes to mind. Regardless, it's funny as hell and was viewed by everyone and their mom. No matter what the rest of this post says about data visualizations for attracting links, the bottom line is that if you've got a good idea that would be best be shared in graphic form, roll with it. Because this graphic was originally hosted on imgur.com, the link metrics behind it are a bit fragmented. The .jpg file itself has over 200 linking root domains in OSE, and according to the designer it was, "Viewed over 1,000,000 times and featured #1 on the reddit homepage, LaughingSquid, FHM, and the LATimes". Induce the viewer to think about the substance rather than about methodology, graphic design, the tech of graphic production, or something else. Tufte wrote this originally in 1983, and while the spirit still holds, I think it should be revised for today's times, especially framed in the context of link building: Our data visualization should provoke thought AND influence the reader to share. Data visualizations built around economic and social matters are surefire ways to get your audience thinking and also have an inherent shareability (a product of the times and the human condition, I suppose). David McCandless's The Billion Dollar Gram is a visualization that provides context to the incomprehensibly large monetary figures we hear in the media. Despite not offering an embed code or dead-simple social sharing buttons, this visualization was a success: 2,801 tweets, 4,677 Facebook Shares and Likes, and 298 linking root domains. Regarding the focus on substance rather than methodology, Tufte explains that the map makes a fantastic visualization medium because we've no reason to question methodology. A map is recognizable, allows us to put a lot of data in a small space, and displaying the data within allows us to easily understand and compare as needed. We'll see a map before this post is done. It should go without saying that a great piece of data visualization should tell the story honestly. Pie graphs, and especially exploded 3D pie charts, are the favorite whipping boy of data viz geeks, often because of their distortion and lack of clarity ("chart-junk"). I can't believe I'm putting this in a blog post, but 'with great power, comes great responsibility'. Yikes, quick shower, hold on. But, it is true. If you've got great data, do it justice by presenting it honestly. NPR did a visualization about the makeup of the US military that took a ton of interesting data, and represented it in a variety of formats. Did it work? Well, it didn't exactly kill it according to OSE (12 linking root domains, handful of tweets, and 700+ Facebook shares/likes), but I don't suspect a news organization like NPR makes much of a link building outreach effort. Charles Joseph Minard was a French civil engineer that created what Tufte calls, "The greatest statistical graphic ever drawn": A map of the Napoleon's Grande Armée's advance and retreat into Russia. The graphic impressively manages to depict 6 different sets of data: latitude, longitude, direction of movement, time, temperature, and size of the army. Obviously, because this is a graphic made in the 1800s, looking up link metrics would be a bit silly. Distilling down a big chunk of data is not easy, and the onus often falls on the designer. Tufte laments that the "lack of quantitative skills of professional artists" is what makes designing a great data visualization difficult. The best designed visualizations exist as a symbiosis between smart quantification and beautiful and elegant design. Some fun data, for sure, and people loved it. Open Site Explorer shows 92 linking root domains, 3,000+ Facebook shares/likes, and nearly 1,000 tweets. Though not necessary, interactivity makes comparing data in a visualization particularly fun and engaging. Sometimes the best use of a dataset is to present the viewer with the controls, letting them uncover things on their own. I had a lot of fun playing around with Hotspots' interactive display of Twitter buzz for this year's Superbowl ads. It's too new for link metrics, but I'm honestly surprised at the lack of social mentions: Only 29 shares/likes and 96 tweets? Many ambitious datasets call for a visualization that gracefully handles the large, 30,000 foot figures way down to the super granular, all while maintaining the proper spatial relations. This allows the viewer to explore the data; he or she understands the big figures quickly, but has the opportunity to pick out some of the more minute details. This infographic by the Technology Review details the space launches by country. It's a two horse race between the US and the USSR/Russia, but it's pretty fun to see how other countries have done space launches as well. Its links were split between the PDF infographic and the post announcing the infographic. All told, it's still one of the least linked-to (roughly 30 LRD) and socially mentioned visualizations (~300 likes/shares, 29 tweets) in this post, but as with the NPR visualization, there likely wasn't much link building outreach done. What's the hook? After brainstorming ideas for clients at Distilled, this is how we narrow down our options. If you're not telling a story to an audience that will care, you're destined for a piece of linkbait that'll fall flat. I could expend the effort to visualize, say, the number of fast food restaurants in Bergenfield, New Jersey (my home town – I cried when Roy Rogers was closed) over time, but who would really care? We put together an interactive visualization for Food Service Warehouse that compared the average calories consumed per day with the percent of income spent on food broken down by country. The result was a successful infographic (still a bit new for link metrics, but 26 LRD including newyorker.com, one.org and heifer.org, to go with 2,000+ likes/shares, and 1,200+ tweets) that highlighted the food consumption and economic disparity throughout the world. While your data visualization should be able to speak for itself, every release should include a link off to the raw data, and some explanation of the how and why. Your writeup provides you with an opportunity to explain why your findings are important, as well as highlight other interesting findings. Sometimes your visualization warrants further explanation, but doesn't fit within the graphic itself. Thomson Travel's How Music Travels – The History of Western Dance Music was a one-page interactive graphic, with further explanation and sources in the announcement blog post. This data visualization was arguably the most successful of the ones in this post, with almost 250 LRD, 24,000+ shares/likes, and 5,000+ tweets. So if you follow each of these principles will you definitely succeed in getting links for your data visualization? Of course not. It's important to remember that the data visualization is still just a medium for presenting (hopefully) interesting content, in the same way that the a blog might be home for a link bait blog post. Sure it helps to have a beautiful visualization or a crazy-awesome design for your blog, but it's still just a frame around what matters most. Still, in the same way that your blog should follow some best practices for allowing maximum exposure like proper keyword research, social buttons, comments, etc., I'm hoping some of Edward Tufte's principles help improve the quality of your next great data visualization.